2016 saw Ducati celebrate its 90th anniversary. Through several changes of ownership culminating in its acquisition by Lamborghini for Audi AG in 2012, the brand and the people behind it have remained focussed on delivering a unique riding and ownership experience to the world’s most discerning motorcyclists – whether racer, tourer or poseur. I had the pleasure of working with David M Gross, their Creative Director and turnaround expert during the company’s ownership by the private equity firm Texas Pacific Group and through a period of transformation which drastically changed the fortunes of the brand. 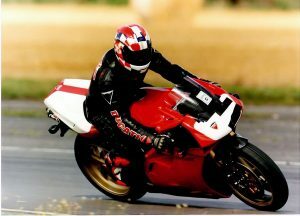 The photo is of me on my much modified and loved Ducati 916 SPS, evidence that I throw myself into client projects in much the same way as I do into sweeping bends.